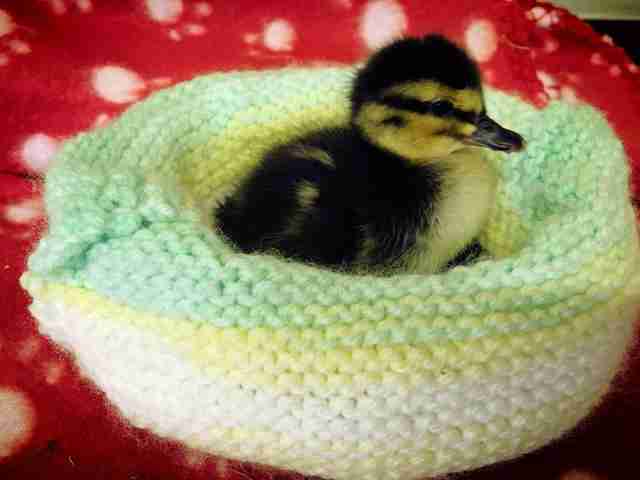 This lonely duckling lost his family, but he clearly never gave up hope. Now he's passing all his love along to a younger orphan who needs it most. Annette Pyrah, who runs the Wildlife Orphanage in England, rescued the young duck earlier this month after he was found wandering down the street with no mother in sight. It's unclear how he ended up being apart from his parent, but without special care he stood little chance of surviving. 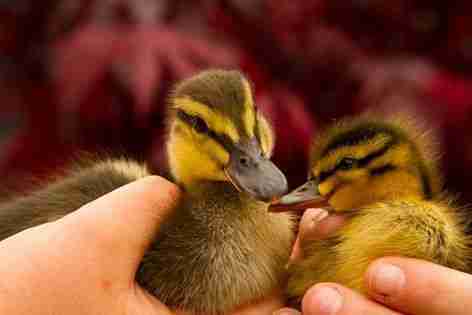 Fortunately, in the weeks that followed, the duckling kept growing up under Pyrah's watchful care. Little could she have guessed, however, that he would soon step in to play the role of savior himself to another helpless baby bird. But that's exactly what he did. On Sunday, Pyrah was called upon to rescued one more duckling. This one, just hours old, was left as the sole survivor after her mother and all her siblings were killed by a group of children. Although she was so young, the baby seemed nevertheless traumatized by the horror she had witnessed. "I put the new duckling in an incubator, but I thought she was going to die," Pyrah told The Dodo. "She kept crying and crying, for hours. I thought she shouldn't be alone, so I took her out and put her with the other duckling. I was worried at first, since ducklings can be quite unfriendly to strangers, but they just fell asleep together." Amazingly, the young duckling not only survived the night - by morning, she seemed suddenly at peace. The larger duckling, too, appeared to be more than accepting of his new smaller companion, so Pyrah decided to keep them together. "Their backgrounds are both very sad, and they were both very lonely, so I think they find solace in one another," she said. "The little one would have died that night, but she made it with his help. I think she'll keep doing well." 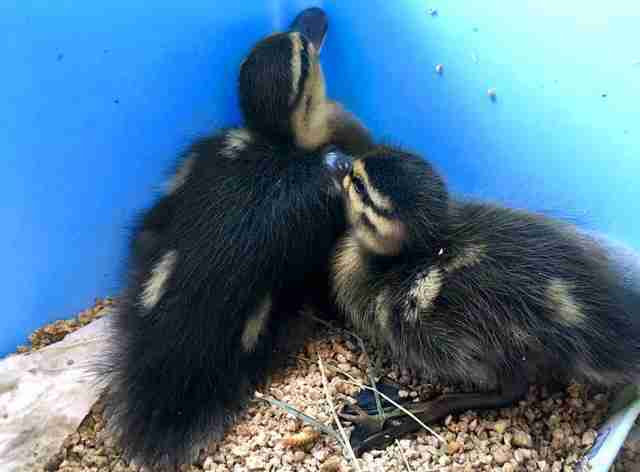 Since that first night together, the two orphaned ducklings have been inseparable. The larger of the pair, though just a couple of weeks her senior, has taken on an almost motherly role to the recently arrived duckling. Turns out, he's quite a caring older brother to his newly adopted sister. "He has been watching over the little one," Pyrah said. "He's been helping her along, and she's always there following." 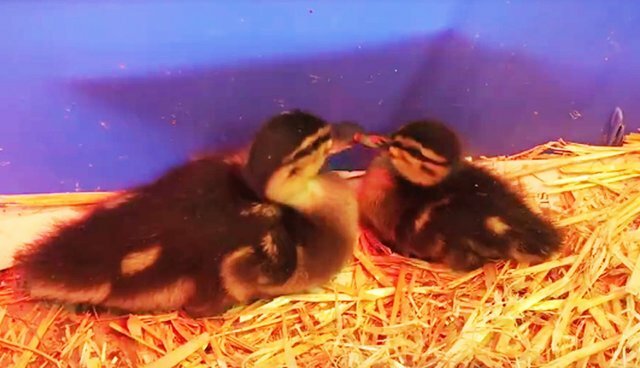 Had tragedy not befallen them, of course, the two ducklings would have grown into maturity with a dozen or so natural siblings of their own - but thanks to chance offered to them both by their rescuers, they've found the next best thing. "They both lost their moms, so I think that makes them kindred spirits," said Pyrah. "In a few months, when they are old enough, we'll move them out to our pond and they'll learn to be ducks. Until then, they'll have one another for companionship."